Cyclists on the Minuteman Bikeway in Lexington. <?EM-dummyText [Insert a reference for this object link]>This Help Desk story is the result of a reader’s question about where to find more information on the New England rail-trail system. If you have a question you’d like Globe writers to address, submit it online or e-mail christine.morris@globe.com. The Rails-to-Trails movement is a feel-good story, a win-win for everyone. In the late 1800s, miles of railroad tracks criss-crossed the country, providing a favored and necessary mode of transportation. But then cars took over. Highways were built, roads improved, and railroad travel plummeted. The railroad corridors, connecting major cities and sights across America, were largely abandoned. In 1986, a group of activists sought to preserve the corridors for public use and formed the nonprofit Rails-to-Trails Conservancy. Today, the RTC has more than 160,000 members, and has developed 2,090 rail-trails, stretching 23,501 miles across the country. The trails are also generally accessible for all ages and abilities. “They’re flat; they’re wide, and they’re usually pretty smooth,” says Sexton. Your best source for information is the RTC website, www.railstotrails.org, where you’ll find a list of rail-trails across the country, up-to-date news on the rail-trail system, and studies and articles on specific trails and advocacy projects. RTC membership is $18 (though they often run special promotions throughout the year), and includes four issues of Rails to Trails magazine, a monthly eNews publication, and special deals on guidebooks, T-shirts, and other items. Two New England rail-trail guidebooks were recently published, and are available online, at selected bookstores nationwide and through the RTC website. “Rail-Trails: Northern New England” covers trails in Maine, New Hampshire, and Vermont; “Rail-Trails: Southern New England” covers Massachusetts, Connecticut, and Rhode Island. The books feature maps, length and condition of each featured trail, directions to trailheads and endpoints, website links, and general descriptions of the routes. Here’s a peek: www.railstotrails.org/magazine/green-issue-2018. 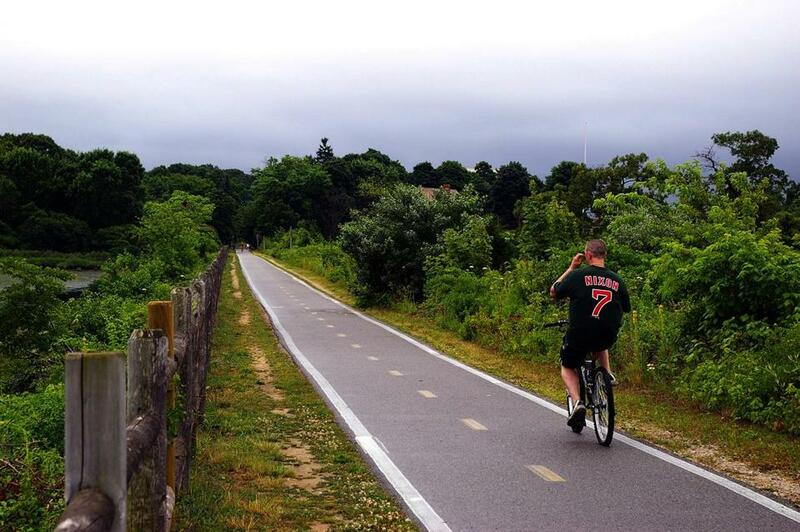 In Massachusetts, there are currently 69 rail-trails, covering 347 miles. A massive new project proposed by the Metropolitan Area Planning Council, called the Landline, seeks to connect these trails, creating a 1,400-mile network of greenways and foot trails within the Boston region. When finished (currently 45 percent of the greenway network and 60 percent of the foot trail network is complete), the network would bring trail access within a half mile of three-quarters of the region’s residents, and 92 percent of residents would be within one mile of the nearest trail or path. For more information on the proposed project visit www.mapc.org/transportation/landline. Ready to hit the trail? 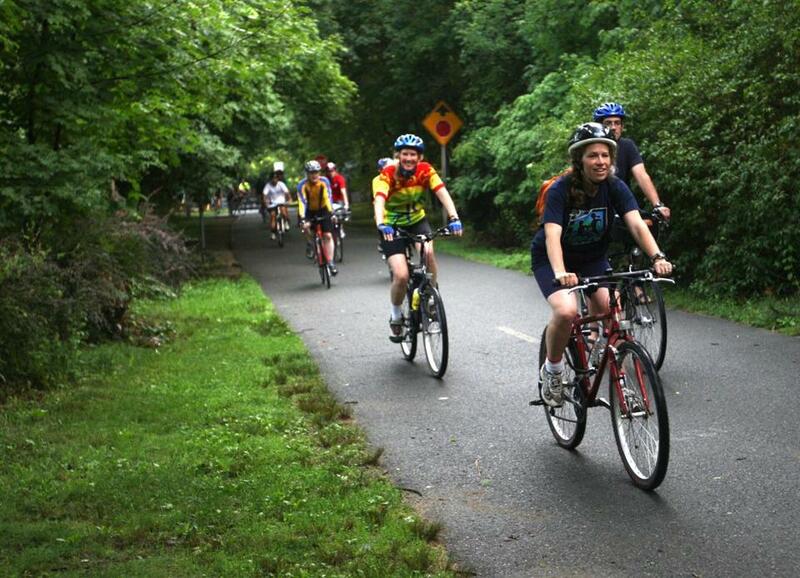 Here are five top-ranked rail-trails in New England. The 10.4-mile trail, dubbed America’s Revolutionary Rail-Trail, runs from the Alewife MBTA Station in Cambridge through Bedford, Lexington, and Arlington. Along the way, visit the National Heritage Museum, Munroe Tavern and British History Museum, and the 1698 Hancock Clarke House where Paul Revere and William Dawes went to warn Samuel Adams and John Hancock that the British troops were coming. There are also several natural areas to explore, including a nature path around the Arlington Reservoir, the 17.5-acre Parker Meadow with paths and boardwalks, and the Great Meadows National Wildlife Refuge along the Concord River. The East Bay Bike Path extends from East Providence along the way to Bristol, R.I.
You’ll have water views galore on this rail-trail, running about 14 miles from Providence to Bristol, R.I. Much of the paved path, which was inducted into the RTC Hall of Fame in 2009, follows along or near the shores of Narragansett Bay. The popular commuter rail-trail connects eight parks: India Point Park in Providence, Bold Point and Squantum Woods in East Providence, Haines and Veterans Memorial Park in Barrington, Burr’s Hill Park in Warren, and Colt State Park and Independence Park in Bristol. Here’s a great way to escape Falmouth’s legendary traffic jams: Hop on this 10.7-mile paved path that travels from North Falmouth to the Steamship Authority parking lot in Woods Hole. It’s an easy, smooth, mostly level ride, and along the way, you’ll have views of cranberry bogs, marshes, beaches and Vineyard Sound. There’s even an ice cream shop and a bike repair station along the trail, and plenty of shops and restaurants when you reach Woods Hole. Another RTC Hall of Famer, this 13.4-mile multi-use trail in Vermont is a showstopper, traveling along the shores of Lake Champlain. Start at waterside Oakledge Park in Burlington, and head north, passing beaches and natural areas, with sweeping views of the lake and Adirondack Mountains. You’ll cross the elevated Winooski River Bridge, before entering the Colchester Causeway, a narrow strip of land extending some three miles into Lake Champlain. Get off busy Route 1; ride your bikes instead! This coastal Maine rail-trail stretches 87.9 miles from Ellsworth to Pembroke near the Canadian border, and is part of the East Coast Greenway. It’s flat and easy-going, passing through woods, nature areas, and coastal villages, with plenty of water and mountain views. The trail is open year-round for snowmobiling, ATV riding, walking, bicycling, cross-country skiing and horseback riding.